The Citigo has Skoda's new finned grille set in chrome frame. 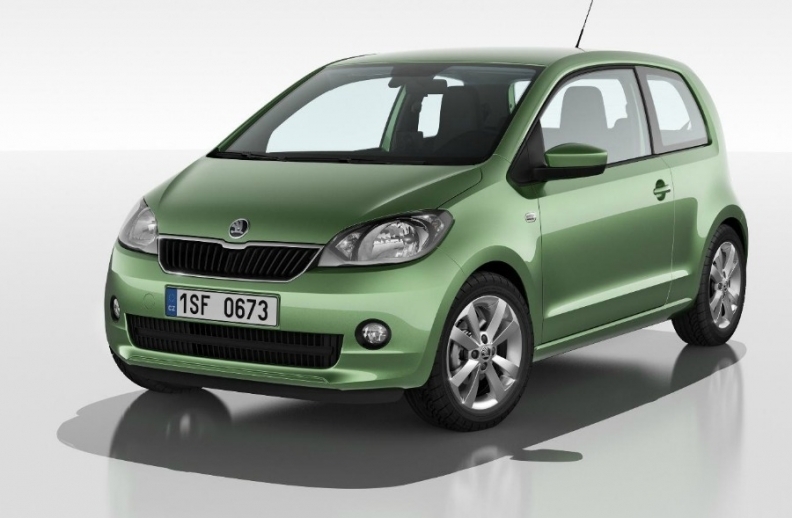 Skoda released details of its new minicar, the Citigo, which will play a key role in the Czech brand's growth plans. The Citigo is the brand's first entry in the minicar segment and is Skoda's version of the Volkswagen Up, which was unveiled at the Frankfurt auto show earlier this month. Like the Up, the four-seat Citigo will be sold as a three- or five-door car, and it will offer an active braking system called City Safe Drive that applies the brakes at speeds below 30kph if a laser sensor identifies a danger of collision. "The Citigo is one of the pillars of our growth strategy. It paves the way for our brand to enter a very promising segment," said Skoda Chairman Winfried Vahland, in a statement on Wednesday. Skoda is aiming for annual sales of 1.5 million units by 2018, up from 762,600 in 2010. The Citigo will go on sale in the Czech Republic in December and in other European countries next summer. The three-door version will launch first, with the five-door variant expected toward the end of 2012. The model will be offered with a choice of two three-cylinder, 1.0-liter gasoline engines with CO2 emissions as low as 97 grams per kilometer and fuel economy of 4.2 liters per 100km for the Green Tech version. Skoda has not announced prices for the Citigo. German press reports said the car will likely will cost from 8990 euros, 860 euros less than the VW Up. Skoda said the Citigo will be aimed at young drivers, families looking for a second or third car and retired people. Production will begin at Skoda's Bratislava plant in October.